I have always been what my family refers to as the “Goddess of toss together casseroles”. Working mom, didn’t always get a chance to get to the store.. OMG I NEED TO FEED MY KIDS! With some creativity, you can turn anything you have on hand in your pantry, fridge or freezer into a quick, kid friendly meal. 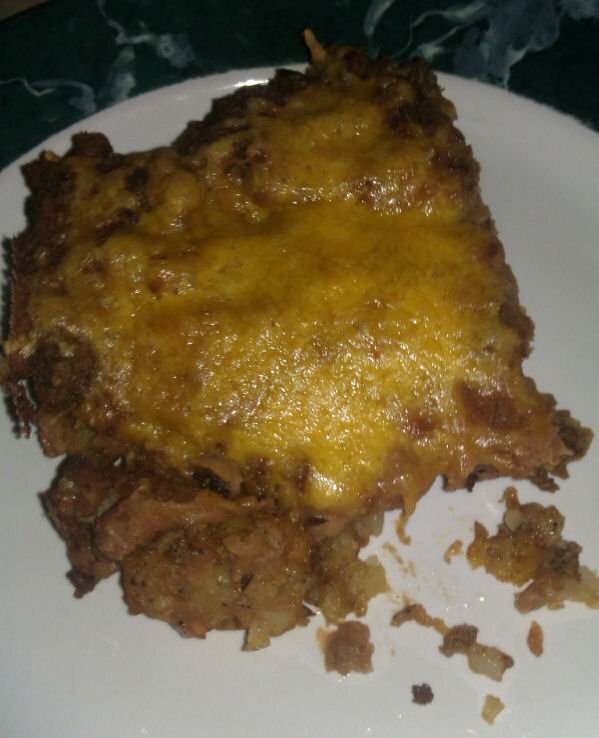 Tator Tot Taco Pie, plated by itself. I am going to apologize for the photos. For some reason my camera batteries did not charge. I took these with my cellphone and they are not the best. This idea came from the fact that I still had a bunch of home made tator tots in the freezer, a pound and a half of ground beef in my fridge, AND what kid doesn’t like tacos? Not to mention, it was a quickie… low prep and cook time, plus they were happily eating with in half an hour. I could sit back and enjoy my coffee. I served this with left over cucumber and onion salad for a balanced meal. I am only showing the straight out of the pan finished pieced here. Prep Time: 15 mins, total cook time 30 mins. Makes about 6 servings, 8 if its for children. 16 oz (2 cups) home made or canned refried beans. 1 and 1/2 pound ground beef (you can use 1 and 1/2 lbs of other cooked meats, such as shredded chicken, pork, or just veggies.. That should be about 1 and 1/2 cups to 2 cups of meat or veg). 1 and 1/2 tablespoons of taco seasoning, (home made or packaged). Arranged tator tots in a single layer in a greased 13×9 dish. To skillet, add onion, garlic and ground beef or other meat of choice. Brown, cook ground meat completely. In a small pan, start heating your beans on low. Bake tator tots for 15 mins, or until they are no longer frozen, starting to brown up and the ice is off of them. Drain meat if you are using ground, return to skillet. To your meat mixture add either 1 to 1 1/2 tablespoons of home made taco mix (recipe below), OR your own packaged taco mix. If using my home made, add 1/3 cup of water, simmer until water is absorbed. If other, follow the directions for that. When tator tots are out of the oven, and your taco meat is ready, spoon your taco meat over the top of the tator tots, covering well. Sprinkle 1 cup of cheese across the top of the pie. Bake for another 15 mins, until everything is hot and cheese is melted. Cut into 6 to 8 squares and serve. You can garnish with sour cream, tomato, lettuce, salsa…. what ever you like on your tacos. Makes 6 tablespoons, use 1 tablespoon per pound of meat, vary to your taste. 1 to 2 teaspoons of ground black pepper (use to your taste). Combine ingredients in a storage container, mix well to blend the spices. Store in your cupboard. Mix before you use due to settling of the seasonings. I just toss it around in the container with the lid still on. As a base, add 1 tablespoon per pound of drained meat. (you can use this for ground meat. I have also used it in shredded chicken, beef, pork, and even vegetables like summer squash blends, even to season pinto beans as they are cooking up in my crock pot.). Next ArticleFreezer Cooking – My Freezers are about full! That sounds really good. I am going to give this a try. We all like tacos here! That sure does sound good, will have to try it though I will first have to make tater tots. They aren’t known here we have Hash browns but I know they are different to TT’s. Could do with a few mushrooms though ;).